Warm and cosy evening, there is a pot of water boiling for a nice cup of tea, the fire is crackling in a fireplace. For many, this is the idea of ultimate relaxation, even now, when fireplaces became quite rare. Fire was and still is a vital part of our lives, we harnessed its wild power and used it for our great success, and till this day, our fascination never really ceased to burn. Will we still be able to relax in their warm glow in the future? Historically, the fireplace was central to the domestic life - the cavemen taming the flames and using primitive firepits, incredible roman underfloor heating, medieval fireplaces in the centre of the house, the invention of chimneys, metal lined stoves, oil burning furnaces, elaborately decorated 20th century fireplaces - they were used for heating, cooking and even as a fashionable furniture centrepieces. For example, in the 19th century, the stoves were designed according to the fashion of the time, generally quite ornate and lavish and, of course, pricy - suggesting that even in the turbulent era of the Industrial Revolution, the thousands of years old fireplace was still a staple in a wealthy Victorian home. Today, only a small number of houses have fireplaces. Across England and Wales, fireplaces are installed only in 11.2% of all homes. Most homes with fireplaces are in the southern regions of England. South East has 15.2% homes with fireplaces, South West has 13.7%, East of England has 13.4% and London has (only) 10.4%. Comparing the number of fireplaces in houses and flats in different regions also yields some interesting information. In the SE region, the most fireplace-rich one, 20.1% of all houses have fireplaces, but only 3.7% of flats do. 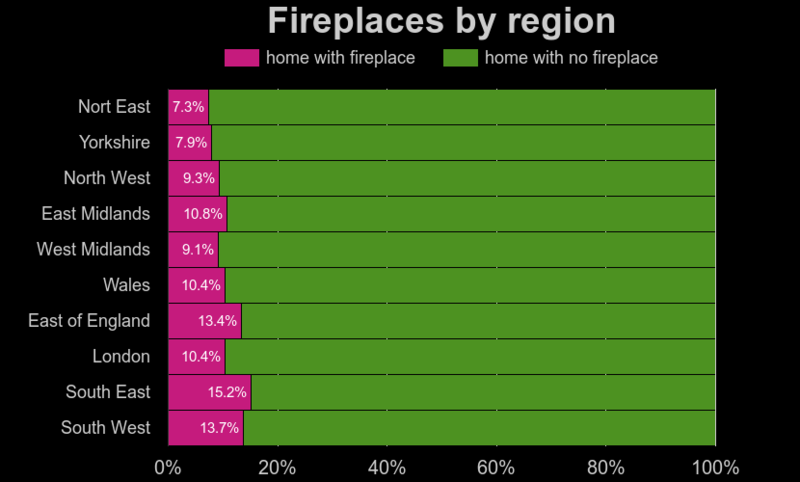 Same with SW region, where 17% of houses and 4.2% of flats have fireplaces. And the same can be seen even in the least fireplace-heavy region, the NE, with 8.4% of houses having fireplaces and only 3.1% flats. What is interesting is comparing these numbers with London, where the number of flats makes up about 70% of all homes. As mentioned before, 10.4% of dwellings in London have fireplaces - 19% of houses and 5.7% of flats. This means that every 5th house in London has one fireplace. Eventually, every 20th has two or more. Most houses with fireplaces occur in South West London - 33.1% and West London - 29.4%. And with 5.7% of flats having a fireplace, London also has the largest number of flats with fireplaces across the regions. Modern fireplaces seem to emit an aura of exclusivity, as we do not need wood or coal burning stoves for cooking or heating anymore - we have advanced a lot, harvesting wind or solar power, gas, coal and other means of producing energy are evolving every day and the old heating appliances are thus becoming obsolete. Another reason the fireplaces are going out of fashion is the focus on greener energy, pollution and, especially in London, smoke control. The last of the three riders of the fireplace apocalypse, smoke control areas, are places, especially in London where the pollution sometimes borders choking hazard, where you cannot emit smoke from a chimney unless you are using authorised fuel or fall under some exception from this rule. This rule applies to the whole Inner London and some adjacent areas and you can be fined up to £1000 for breaking it. Another problem is the burning of unseasoned wet wood, which is cheaper than kiln dried wood, but also much more polluting. In more rural areas, this practice is still not completely eradicated, even though it is known to be clogging the flue and damaging the burner in the process. Some also argue that modern EU approved burners using dry wood are still 18 times more polluting than, for example, a modern diesel car. But on the other hand, wood is, unlike gas or coal, a renewable resource and modern EU approved stoves have reduced environmental impact. And of course, burning wood is still cheaper than all the other alternatives. So, can we still hope for a fireplace renaissance? With the depletion of other, greener but not renewable resources and the indisputable appeal to our wallets as well as to our hearts, it is possible that one day, the fireplace becomes once again the warm centre of our daily life.